The early music festivals at the King of Hearts, Norwich, UK have always been noted for their breadth of repertoire. And the 2005 Festival, which closes tonight, explored new extremes with a concert of 20th century music for flute and piano. Last night (Friday 14th Oct) pianist Peter Hill and flautist Sarah O'Flynn gave an outstanding performance of an adventurous programme including Frank Martin's Ballade, the flute sonatas of Poulenc and Prokofiev, and Debussy's Syrinx. But the highlight of each half of the concert was a work by Messiaen. In the first half Peter Hill played the Première Communion de la Vierge from the Vingt Regards sur l'Enfant-Jésus, and in the second half he was joined by Sarah O'Flynn for one of only two chamber works that Messiaen composed. Le Merle noir (the blackbird) for piano and flute, composed in 1952, is important as it is the composer's first free-standing 'birdsong' work, and was the start of a ten year period of composition inspired by birdsong. Flautist Sarah O'Flynn has worked with many leading UK orchestras, but is best known for her work with new music group Chroma. Their recent projects have included working with John Woolrich and Robin Holloway in London, and on The Memory of Colour by Ed Hughes for ensemble, tape and live electronics written in response to an art installation by Teruyoshi Yoshida, and a new work by the leading contemporary Czech composer Pavel Novak. Pianist Peter Hill studied both with Nadia Boulanger and Olivier Messiaen. He recorded, with the composer's help and guidance, all the piano works of Messiaen in a 7 CD set. His other recordings include the complete piano music of Berg, Schoenberg and Webern for Naxos. He is also a noted interpreter of Xenakis, Pousseur and Crumb. Next week Yale University Press publish his new book, co-authored with Nigel Simeone, titled Messiaen. The authors were granted unprecedented access to Messiaen's private archives by his widow, Yvonne Loriod-Messiaen. Research uncovered considerable new information, including that, after release from a prisoner of war camp in France, Messiaen worked for twelve weeks for a cultural organisation under the Nazi puppet Vichy government. During that short period he contributed to a patriotic cantata for performance by schoolchildren, the score of which is lost. The new book also debunks the myth that the Quartet for the End of Time was given its premiere in front of 5000 prisoners. In fact records showed that the first performance was in camp hut holding less than three hundred. The venue for this concert of Messiaen and other 20th century composers, The King of Hearts, is an illuminating study in how a 'niche' performance venue can consistently attract both international calibre performers, and a loyal audience. The conversion of the city centre Tudor (16th century) building into a superb performance space was the brainchild of the Director & Artistic Manager Aude Gotto, ably assisted by her husband, and master-builder of superb harpsichords, Alan Gotto. The ancient building was converted from a derelict state fifteen years ago, and is run as a charitable (not for profit) community centre for both the visual and musical arts. (The painting above is Evelyn Williams' Mother and Child, and the scuplture is Jiggilipuff by Vanessa Pooley, both from the Gallery's collection). 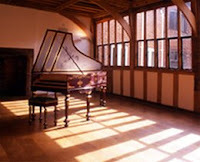 The gem of The King of Hearts is the music room, This is a medieval complete with beamed ceiling and oak floor. The room is acclaimed for its excellent acoustics and intimate atmosphere, and is ideal for chamber music and solo recitals. It houses both a Steinway piano and double manual harpsichord by Alan Gotto. The music room can only seat an audience of seventy-five, but such is the reputation of the venue and the appeal of the performing space, that top international musicians regularly accept reduced fees to perform there, and return frequently. Among the performers in the 2005 season are Andrew Manze, Richard Egarr, and James Bowman. 9th Oct: London Baroque with Lorna Anderson, soprano. Purcell, F.Couperin, Marin Marais and Montéclair. 12th Oct: Passacaglia baroque ensemble. Dornel, J.S. Bach, de la Barre, Le Roux, Hotteterre, Marin Marais, Blavet. 13th Oct: Carolyn Gibley, harpsichord. Scarlatti, Handel, Froberger. 14th Oct: Sarah O'Flynn (flute) and Peter Hill (piano). Martin, Poulenc, Debussy, Messiaen and Prokofiev. 15th Oct: Mitzi Meyerson, harpsichord. F. Couperin, Rameau, Forqueray, and D'Englebert. The harpsichord used in the concerts, other than the 20th century repertoire, was made in Norwich by Alan Gotto after an original by Donzelage made in Lyon in 1716. The lid painting is by Angie Maddigan after a 17th century Flemish original. This harpsichord is the property of Charles Hoste who loaned it for the Festival. Watch out for the Warner budget re-release of Erato's recordings packaged as the Messiaen Edition. 18 CDs for around £60 ($105), and including performances by Yvonne Loriot. The myth that Messiaen's Quatour pour la Fin du Temps (Quartet for the end of Time)was premiered before an audience of 5000 prisoners of war is new to me. Given that the work was premiered on January 15, 1941, in Gorlitz (now unequally divided between Germany and Poland), I always imagined the work being premiered in a barracks-type environment. "He recalls that at the time he and everybody in the camp were freezing, starving and miserable. The starvation was such that it heightened his 'coloured' dreams and this coupled with the experience of seeing the 'aurora borealis', coloured waves of clouds, led him to compose [the Quartet]." Garth, I think the news of Messiaen's brief tenure with a Vichy cultural organisation probably comes into the 'composer's trivia' category, no more. (Publishers have to find something to sell books). But the Vichy inspired children's pageant about Joan of Arc is tantalising isn't it? Sounds like a garlic flavoured Horst Wessel Lied to me.